Ramotion is a remote branding and product design agency that has worked with Bay Area tech startups since 2014. While they typically do branding for funded, fast-growing startups, Ramotion has helped companies ranging from Bitmoji’s early brand identity to Mozilla’s rebrand. We spoke to Ramotion’s CEO Denis Pakhaliuk about their iterative approach, his favorite branding projects and more. Yvonne Leow: Can you tell me about your journey and how you came to create Ramotion? Denis Pakhaliuk: Yeah, I started as a CG designer more than 10 years ago. I was doing computer graphics, CG modeling, digitalization of architectural design and automotive design. I was initially very focused on German cars and industrial design. Once iPhone 3G came out, I switched to doing UI design for mobile apps, which was a very hot topic at the time. From that point I met a guy who just said, “Hey, I’m thinking of building an agency,” and so we decided to do it together. It started with a few people and now we have up to 30. We focus on different products, from small companies to more established brands, like Salesforce, among others. So yeah, it’s been a fun journey. Yvonne Leow: At what point did Ramotion start working with startups? Why do this? Because great founders and great growth marketers are often one and the same. They’re multi-disciplinary executors, they take ownership and they’re passionate about product. You see, a marketing role with sufficient autonomy mimics the role of a founder: In both, you hustle to acquire users and optimize your product to retain them. You’re working across growth, brand, product and data. As a result, struggling founders wanting a break from the startup roller coaster often find transitioning to a growth marketing role to be a natural segue. Broadly speaking, the enterprise app will most likely succeed through the following customer acquisition channels: sales, offline networking, Facebook desktop ads and Google Search. In contrast, the e-commerce company will most likely succeed through Instagram ads, Facebook mobile ads, Pinterest ads and Google Shopping ads. We can narrow it even further: In practice, most companies only get one or two of their potential channels to work profitably and at scale. Meaning, most companies have to develop deep expertise in just a couple of channels. Resources are always limited. One of the most important jobs of a growth marketer is to ensure growth resources are focused on the right opportunities. I’m looking for a candidate that has a process for identifying, evaluating and prioritizing growth opportunities. Did they create ads and propose A/B tests thoughtfully? Did they identify the most compelling value propositions, write copy enticingly and target audiences that make sense? Have they achieved mastery of 1-2 acquisition channels (ideally, the channels your company is dependent on to scale)? I don’t expect anyone to be an expert in all channels, but deep knowledge of at least a couple of channels is key for an early-stage startup making their first growth hire. Give them a week-long sample project. Assess their ability to generate ideas and prioritize them. ProcessOut has grown quite a lot since I first covered the startup. The company now has a ton of small and big clients, from Glovo to Vente-Privée and Dashlane. The company has become an expert on payment providers and payment analytics. The core of the product remains the same. Clients sign up to get an overview on the performance of their payment systems. After setting up ProcessOut Telescope, you can monitor payments with expensive fees, failed payments and disappointing payment service providers. And this product is quite successful. Back in October 2018, the company had monitored $7 billion in transactions since its inception — last month, that number grew to $13 billion. The company is adding new features to make it easier to get insights from your payment data. You can now customize your data visualization dashboards with a custom scripting language called ProcessOut Lang. This way, if you have an internal payment team, they can spot issues more easily. ProcessOut can also help you when it comes to generating reports. The company can match transactions on your bank account with transactions on different payment providers. If you’re a smaller company and can’t optimize your payment module yourself, ProcessOut also builds a smart-routing checkout widget. When a customer pays something, the startup automatically matches card information with the best payment service provider for that transaction in particular. Some providers are quite good at accepting all legit transactions, such as Stripe or Braintree. But they are also more expensive than more traditional payment service providers. ProcessOut can predict if a payment service provider is going to reject this customer before handing the transaction to that partner. It leads to lower fees and a lower rejection rate. The company recently added support for more payment service providers in Latin America, such as Truevo, AllPago and Mercadopago. And ProcessOut now routes more transactions in one day compared to the entire month of October 2018. As you can see, the startup is scaling nicely. It will be interesting to keep an eye on it. The development has been speculated for some time — as far back as October — and it serves to both remove a deeply unprofitable unit from the main Uber business, helping Uber scale back some of its losses, while giving Uber’s Advanced Technologies Group (known as Uber ATG) more freedom to focus on the tough challenge of bringing autonomous vehicles to market. The deal values Uber ATG at $7.25 billion, the companies announced. In terms of the exact mechanics of the investment, Toyota and Denso are providing $667 million, with the Vision Fund throwing in the remaining $333 million. The deal is expected to close in Q3, and it gives investors a new take on Uber’s imminent IPO, which comes with Uber ATG. The company posted a $1.85 billion loss for 2018, but R&D efforts on “moonshots” like autonomous cars and flying vehicles dragged the numbers down by accounting for more than $450 million in spending. Moving those particularly capital-intensive R&D plays into a new entity will help bring the core Uber numbers down to earth, but clearly there’s still a lot of work to reach break-even or profitability. Still, those crazy numbers haven’t dampened the mood. Uber is still seen as a once-in-a-generation company, and it is tipped to raise around $10 billion from the IPO, giving it a reported valuation of $90 billion-$100 billion. Like the spin-out itself, the identity of the investors is not a surprise. The Vision Fund (and parent SoftBank) have backed Uber since a January 2018 investment deal closed, while Toyota put $500 million into the ride-hailing firm last August. Toyota and Uber are working to bring autonomous Sienna vehicles to Uber’s service by 2021 while, in further proof of their collaborative relationship, SoftBank and Toyota are jointly developing services in their native Japan, which will be powered by self-driving vehicles. The duo also backed Grab — the Southeast Asian ride-hailing company in which Uber owns around 23 percent — perhaps more aggressively. SoftBank has been an investor since 2014, and last year Toyota invested $1 billion into Grab, which it said was the highest investment it has made in ride hailing. “Leveraging the strengths of Uber ATG’s autonomous vehicle technology and service network and the Toyota Group’s vehicle control system technology, mass-production capability, and advanced safety support systems, such as Toyota Guardian, will enable us to commercialize safer, lower cost automated ridesharing vehicles and services,” said Shigeki Tomoyama, the executive VP who leads Toyota’s “connected company” division, said in a statement. If you’re a SaaS business, you’re likely overwhelmed with data and an ever-growing list of acronyms that purport to unlock secret keys to your success. But like most things, tracking with you do has very little impact on what you actually do. The move follows the death of Samantha Josephson, a student at the University of South Carolina, who was kidnapped and murdered in late March. She was found dead after getting into a vehicle that she believed to be her Uber ride. The murder, which has garnered nationwide media attention, seems to have spurred action by the ride sharing behemoths. In response, Uber is launching the Campus Safety Initiative, which includes new features in the app. Currently, the features are in testing, and they remind riders to check the license plate, make, and model of the car, as well as the driver’s name and picture, before ever entering into a vehicle. The test is running in South Carolina, in partnership with the University of South Carolina, with plans to roll out nationwide. Lyft, which went public on March 29, has implemented continuous background checks for drivers this week. (Uber has had in place since last year.) Lyft also enhanced its identify verification process for drivers, which combines driver’s license verification and photographic identity verification to prevent driver identify fraud on the platform. Uber, prepping to debut on the public market, is taking the safety precautions seriously. The new system reminds riders about checking their ride three separate times: the first is a banner at the bottom of the app once the ride has been ordered, the second is a warning to check license plate, car details and photo, and the third is an actual push notification before the driver arrives reminding riders to check once more. Alongside the reminder system, Uber told is also working to build out dedicated pickup zones in the Five Points district of Columbia, with plans to roll out dedicated pick-up zones at other U.S. universities. That said, Uber has also warned investors ahead of its IPO about a forthcoming safety report on the company, which could be damaging to the brand. The report is supposed to be released sometime this year, and will give the public its first comprehensive look at the scale of safety incidents and issues that occur on the platform. “The public responses to this transparency report or similar public reporting of safety incidents claimed to have occurred on our platform … may result in negative media coverage and increased regulatory scrutiny and could adversely affect our reputation with platform users,” said Uber in its April 14 IPO paperwork. Indeed, the issue of safety on platforms like Uber and Lyft, or really any app that asks you to be alone with total strangers, goes well beyond any single incident. A CNN investigation found that 103 Uber drivers had been accused of sexual assault or abuse in the last four years. Fuel Capital led the round. Homebrew and Susa Ventures also participated, along with various angel investors, including Docker co-founder Solomon Hykes, Mesosphere co-founder Florian Leibert and Looker co-founder Ben Porterfield. What Fuzzbuzz does specifically is automate fuzzing at scale, says co-founder and CEO Andrei Serban. “It’s a type of automated software testing that can perform thousands of tests per second,” he explained. Fuzzbuzz is also taking advantage of artificial intelligence and machine learning underpinnings to use feedback from the results to generate new tests automatically, so that it should get smarter as it goes along. It’s still early days, and the startup is working with some initial customers. The funding should help the three founders, Serban, Munro-Zeisberger and Sabera Hussain, to hire more engineers and bring a more complete solution to market. It’s an ambitious undertaking, but if it succeeds in creating a fuzzing service, it could mean delivering code with fewer bugs, and that would be good for everyone. As Kate explains up front, Equity is out a day early this week due to the Big TechCrunch Robotics Affair in Berkeley today. We’ll be back on Friday with IPO news regarding Zoom and Pinterest, and we can’t wait. OK, all that sorted, what did we talk about? Alex wanted to talk about some market signals that he reads as bullish. Whatever went wrong at the end of 2018 has healed over, he thinks, because there have been a whole lot of supergiant venture capital rounds and some other stuff. Next, we gave an example of one of those supergiant rounds in the works. The reported Pax round, which could put $400 million into the cannabis vaping company, intrigues us, especially because Pax is the corporate sibling of JUUL, the now-famous e-cigarette company what sold just over a third of itself for nearly $13 billion last year. A truly staggering deal. Then we turned to Brex, the fintech startup that was back in the news this week. Why? Because it raised a $100 million debt round as startups of that sort do. Brex provides a credit card made specifically for startups that require no personal-guarantee. Yeah, risky, we know. We talked about that risk and Brex’s plan to target Fortune 500 business in the future. Rounds for Ro, Kindbody and Carrot Fertility made it a busy week for healthtech, too. Ro is raising at a $500 million valuation to support its three digital health brands: Roman, Rory and Zero. Meanwhile, a pair of fertility startups, Kindbody and Carrot, brought in $15 million and $11 million, respectively. With Danny back on the show, we extended our reach and discussed the latest in the chip and sensor world. NXP, fresh off a failed, multi-billion-dollar exit to Qualcomm, put money into Hawkeye Technology, a China-based company working in the car sensor space. Equity’s regular hosts mostly nodded as Danny dropped a lot of knowledge. All that and we had some fun. We’ll be back before you know it. Marketers get a lot of incoming information from the data they have to deal with, bound up in hundreds of spreadsheets and reports, making it time-consuming and tricky to get value out of it. Tech companies like Datorama and Funnel.io have appeared to try to lighten this load. Adverity is a data intelligence platform also playing in this space by applying AI to produce actionable insights in real time. Founded in 2015, it’s a cloud-agnostic SaaS platform compatible with Amazon, Google and Microsoft that provides data to destinations such as SQL databases, Snowflake, AWS Redshift, SAP HANA. Its business model is based on yearly subscription fees. It has now closed an €11 million ($12.4 million) Series B funding round, bringing the total amount raised to date to €15 million ($17 million). The investment is led by London-based Felix Capital, with participation from Silicon Valley’s Sapphire Ventures and the SAP.iO fund. The company now plans to use its war chest to expand into the U.S. market. In addition to the latest round of investors, Adverity continues to be backed by existing investors, including Speedinvest, Mangrove Capital (early backer of Skype, Wix.com and Walkman), 42cap and local Austrian company the AWS Founders Fund. Adverity’s latest AI-powered product, Presense, is currently under closed beta testing for select clients and will be launched later this year. Adverity’s clients include companies such as IKEA, Red Bull, Mediacom, Mindshare and IPG. Headquartered in Vienna, Austria, the company has offices across London, Sofia and Frankfurt. The company’s founding members are Alexander Igelsböck, Martin Brunthaler and Andreas Glänzer. Igelsböck previously headed a startup incubator in Austria (KochAbo GmbH), and prior to that was VP Product Management at VeriSign Inc., where he met Brunthaler, who was director of Engineering. Glänzer’s experience was gained in a sales role at Google and as regional head of iProspect. The three previously founded a price comparison technology company that was acquired by Heise Media in Germany. Weengs, the U.K. logistics startup for e-commerce businesses that need a more convenient way of getting online orders to customers, has raised £6.5 million in Series A funding. Leading the round is venture capital firm Oxford Capital, with Weeng’s seed investors, including Local Globe, Cherry Ventures and VentureFriends, following on. The startup, founded in 2017, has raised about $19 million to date. Byron Deeter and Tess Hatch from Bessemer have joined Phantom’s board. The so-called “race” to deploy self-driving trucks, robotaxi services and other applications of autonomous vehicle technology on public roads has encountered a speed bump of sorts that has sent ripples throughout the nascent industry. In short: autonomous vehicles are hard and everyone seems to be waking up to that fact. As deployment timelines have moved, companies have quieted. Some have pivoted, shuttered or been snapped up in acquisitions by other better-capitalized companies looking for talent. Other companies, like Phantom Auto that are adjacent to the industry, are expanding into new areas as they wait for autonomous vehicle developers to catch up. Phantom Auto co-founder Elliot Katz emphasized that the company is still working with customers deploying autonomous passenger and commercial vehicles on public roads. This new logistics business, however, holds more near-term potential. “We continue to be designed into our customers’ stacks who are focusing on AVs on public roads, but it will take some time for autonomous passenger vehicles and commercial trucks to be deployed at scale,” Phantom founder Shai Magzimof said in a statement. The company is working with some of the largest logistics companies in the world, Katz said. Phantom Auto isn’t providing a full list of customers yet; one named partner is Dutch yard truck manufacturer Terberg. Katz told TechCrunch that customers include companies launching autonomous delivery robots. They’re also using the platform to remotely operate forklifts and yard trucks equipped with its teleoperation software. Yard trucks are used by major retailers, for example. 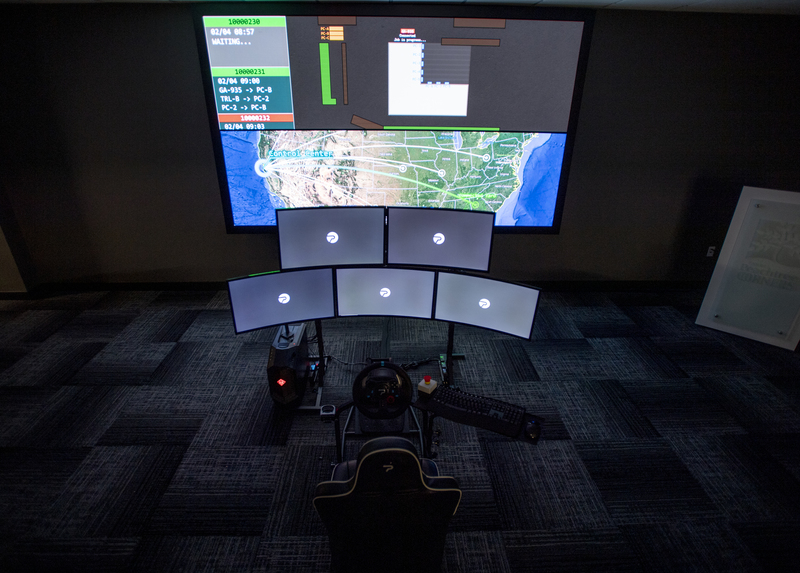 Phantom Auto’s teleoperation platform allows a remote driver, sometimes located thousands of miles away, to take control of an autonomous vehicle if needed. The platform, which uses public cellular networks, isn’t designed to take over in a split second in hopes of avoiding an accident. Instead, it’s used as a safety backup to take control of the vehicle if it encounters a difficult scenario and gets confused, or is even involved in an accident. In the logistics application, the Phantom Auto system is used in low-speed environments. A remote control center could control a company’s yard trucks anywhere in the country. Phantom Auto isn’t employing the remote drivers in this use case. Instead, Katz said these logistics customers typically want to train their own employees how to use the platform. And this doesn’t necessarily replace drivers who are on the ground operating these yard trucks or forklifts. The system is seen as a way to use workers at one location that is experiencing a lull in activity to remotely operate a busier spot farther away. For delivery robots, the platform can be used to help the vehicle handle tricky situations, like stairs or other complex environments.